Our MySQL server seems to be using a lot of memory. I've tried looking for slow queries and queries with no index and have halved the peak CPU usage and Apache memory usage but the MySQL memory stays constantly at 2.2GB (~51% of available memory on the server). Here's the graph from Plesk. Running top in the SSH window shows the same figures. Does anyone have any ideas on why the memory usage is constant like this and not peaks and troughs with usage of the app? The number of used connections is 20% of the configured maximum. The app is a facebook game with about 50-100 concurrent users. 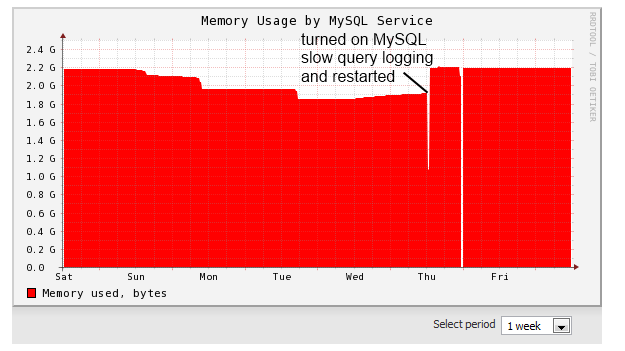 MySQL uses a lot of memory on purpose-- more memory = less disk access = better performance. the constancy of the usage is likely due to table cache, key cache, and query cache. If you want it to use less, you can tune the parameters in your my.conf file; just beware that it may slow down if you take memory away. Take a look at http://hackmysql.com/mysqlreport ; you may be able to get some helpful information there about tuning it without performance loss. Not the answer you're looking for? Browse other questions tagged linux mysql performance-tuning memory-usage or ask your own question.